Dial indicators for single pressure. Dial gages have innovative designs and some products are meant for low pressure while others have multiple ranges or are a combination instrument. The high-precision, milled-teeth movements and pinion and bearing surface, provide the user with top of the line low pressure instruments. Spirahelic® Direct Drive Pressure Gage have applications in systems with high cycle rates, processes with problematic pressure surges and spikes, and environments with continuous vibration or shock. 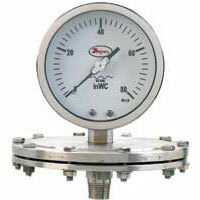 Stainless Steel Schaeffer Gage has ranges of vacuum, compound and pressures are available. Applications include chemical, cement, fertilizer, refinery, and power. 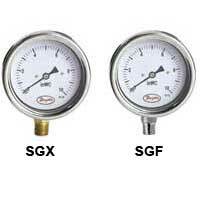 Stainless Steel Schaeffer Gage has ranges in vacuum and compound. Applications include chemical, fertilizer, cement, power, pulp and paper. 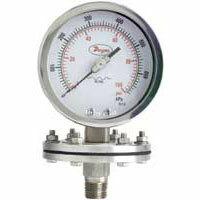 2.5" Low Pressure Gage has an innovative design that has high-precision. Applications include air flow indication and liquid level. 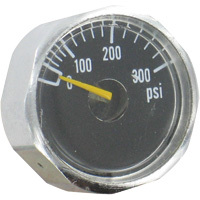 Stainless Steel Low Pressure Gage has a zero adjustment screw on the dial. Applications include pneumatic, liquid level, and draft measurement. Spirahelic® Direct Drive Pressure Gage relies on a bourdon tube in order to be dependable. Applications include systems with high cycle rates and environmental with continuous vibration shock. Low Pressure Gage are designed to be sensitive and meant for low pressures of gases and liquids. Ideal for air flow indicators, liquid level indicators and draft gages. Tridicator Gage is a combination of a pressure gage and a thermometer into one. Measured in psi and kPa as well as Celsius and Fahrenheit. 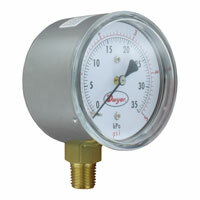 Compact Size, 1" Dial is an economical solution for monitoring high pressure applications. These products are housed in a rugged case. 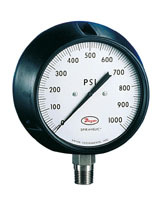 1.5" Industrial Pressure Gage is used in applications that need to be resistant to corrosion. Economical choice where corrosion and vibration are a concern. 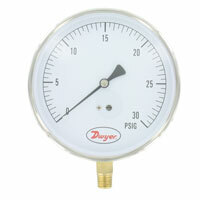 1.5" Industrial Pressure Gage cover a wide variety of ranges from full vacuum to 300 psi. Can withstand up to 140 degrees Fahrenheit. 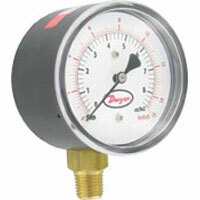 2.5" Industrial Pressure Gage employs an easy-open breather plug on top. Plug easily pops open and does not need to be entirely removed. 2.5" Industrial Pressure Gage has an excellent chemical compatibility and is able to relieve any built up internal pressure by having a breather plug on top. Utility Gage has a center back mounting and compact size makes this gage the perfect choice for pneumatic air regulators. 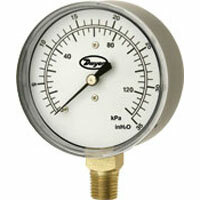 2.5" Utility Pressure Gage is economical and have applications in air regulators and pneumatic systems. A wide variety of ranges are available in this economical gage in either bottom or back connection configurations. 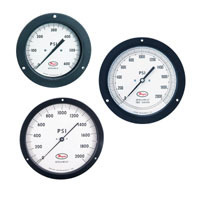 Utility Gage has a wide offering of ranges which are available from full vacuum to 300 psi. Applications include air regulators and pneumatic systems. Tridicator Gage comes in three different connection options including lower mount, center back mount, and center back mount with extension shank. 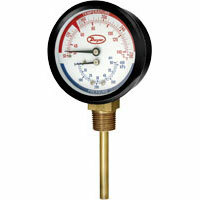 This product is a combination of a pressure gage and a thermometer. Process Gage with Dampened Movement minimizes vibration without liquid filling. Designed with a Phenolic safety-case. Solid front with a blow-out back. Contractor Gage has a large dial and compact design. Gages are lightweight and slim-which are easy to transport. Applications include contractor and industrial applications. 2.5" Low Pressure Gage is available with a bottom or back connection option. Made with a chrome plated steel housing and brass wetted parts. Ideal for air flow indication, liquid level, and draft measurement. Can the Spirahelic® gage be mounted in the horizontal position? Yes, all that is required is calibration in the horizontal position during assembly. Lead-time would be 2 weeks. Pressure Gauge 7112B-GC100, Is this gage suitable for use with hydraulic fluid? Is there any risk of chemical reaction to internal parts? The 7000B Series Spirahelic gage is compatible with hydraulic fluid.